I never really appreciated this recipe as a child. What I now recognise as a wonderful firm, velvet texture was chalky and bland to me then (and part of a general dislike of anything ‘creamy’). The genius of the recipe is that it uses good old jelly in place of faffing about with gelatin – hence the ‘filthy’ epithet. The recipe I wrote down on my last trip home was specifically for an orange version of this, complete with tinned mandarins on top. Yes, I am a child of the 70s. After fiddling around with it, it’s become lime instead. Batter the digestives into submission inside a sturdy Ziploc bag, using a rolling pin. Empty into a bowl and pour over the melted butter, mix evenly. Press this into the bottom of a springform tin and put into the fridge to chill. Heat up the lemon and orange juice in a small saucepan, then add the block of jelly and melt over gentle heat. Using a food processor, whizz together the cheese, sugar, yoghurt and melted jelly. Whip the cream lightly and fold it into the mixture. Pour it into the prepped tin. Allow to set in the fridge. Before serving, remove it from the fridge for 30 minutes. Run a knife around the inside edge to loosen it before removing the springform collar. Grate dark chocolate over the top. If you’d like a sharper taste, use only lime juice for the 1/4 pint of liquid needed to make up the jelly. Also I notice in many cheese cake recipes a suggestion to use softened, rather than melted butter, and to pulverise it together with the crumbed biscuits in a food processor. I’ll be trying that next time. I’ve made a thicker base, you could easily reduce the amounts by a third which might be better balanced. But when it comes to cheesecake, it’s hardly about balance, right? Yup, I’m going to try this. May be good with chocolate digestives as well? Yes I wondered that. Try the dark chocolate ones! Oooh, so very filthy. In the best possible way. Creamy, sweet and very tasty. I love cheese cake in all it’s forms, and I love how straight forward this is to make. I wonder how it would work with a hobnob (guilty pleasure) base instead of digestives. Maybe a little too sweet? 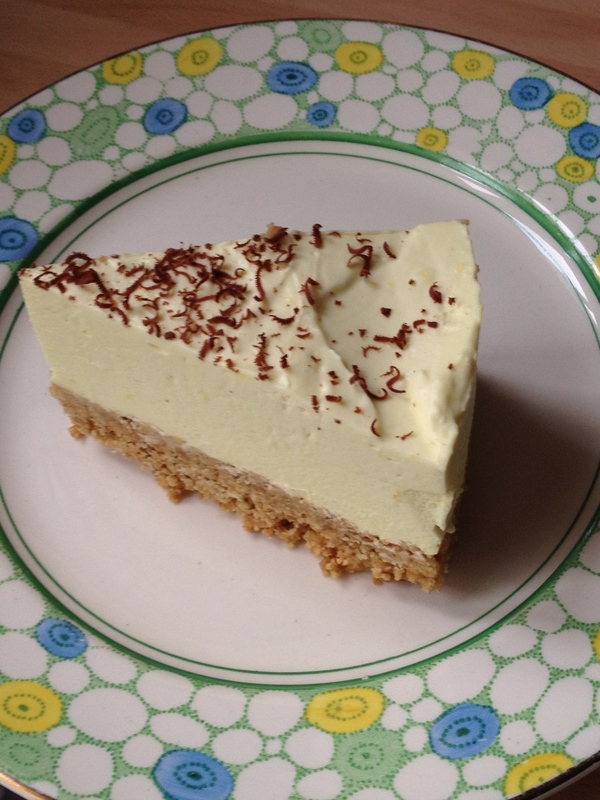 Because I guess the real joy of cheese cake lies in the balance of sweet and creamy savoury… Mmmmm. Filthily good.